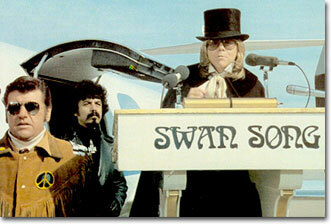 The name of Swan's conglomerate was originally "Swan Song Enterprises". 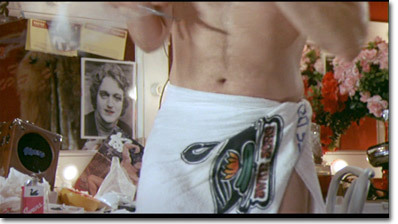 Throughout Phantom of the Paradise, references to that company name are visible here and there. 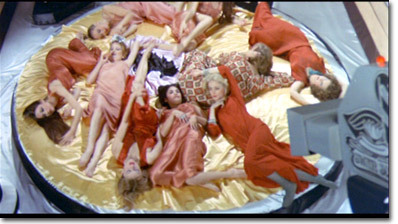 Grant childishly threatened to block release of the film, and De Palma and editor Paul Hirsch were forced to quickly make changes to remove from sight the most prominent references to "Swan Song Enterprises." As can be seen from this purchase order, dated October 1, 1974, the changes were still in progress only weeks before the film's release. And, based on this cost summary, implementation of the changes required about $22,000 in direct out of pocket expenses, which were absorbed by Fox. 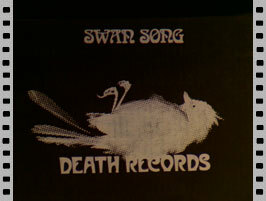 In some cases, references to "Swan Song" were covered up by hand, frame-by-frame, typically by "Death Records," the dead songbird logo, or plain black masking. 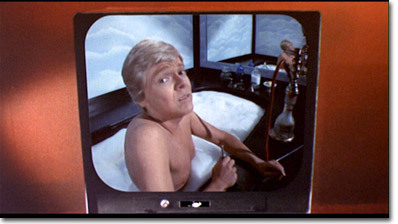 In other cases, the film was recut, with the "offending" footage actually removed. While the best job under the circumstances was done, these last minute mutilations are pretty glaring. 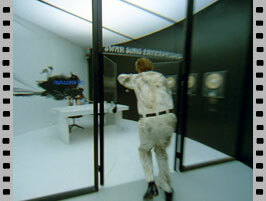 The modifications and deletions made to appease Grant are particularly annoying as it is apparent from viewing the deleted footage as a whole that the film, as planned and shot, employed a recurring theme or motif in which a sequence would open with a closeup of the Swan Song logo (on a billboard, on a record case, on a street sign, etc. 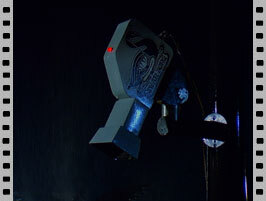 ), and the camera would then move away from the logo to show us the surrounding environment. The overall impression would have been that everything in the world centered on Swan Song, and that Swan was, in essence, everywhere. 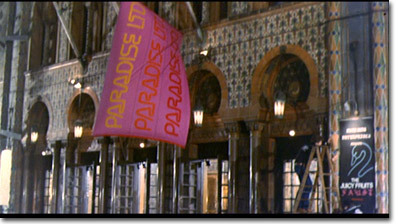 As a result of the changes, this lovely pattern disappeared completely from the film. Here are a few examples of the opening moments of establishing shots being changed in this way. 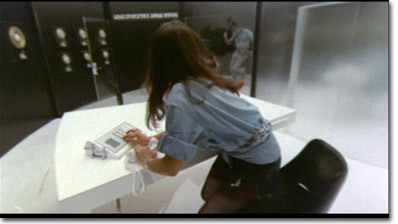 Click on Winslow to see this nice missing camera move, and check out that one sheet from The Sting in the theater's poster case! 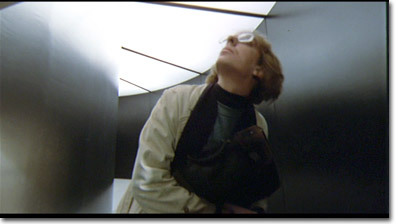 Then, when Winslow first goes to Death Records, we're accustomed to seeing the dissolve from the "Death Records" title card to a shot of Winslow looking up at an offscreen street sign, to confirm he's at the right address. In this previously unseen footage, though, we can finally see -- in a camera move that echoes the earlier move from the Majestic marquee to Winslow -- that the first few frames of this sequence were supposed to have shown us that Death Records is located at the intersection of Swan Song Plaza and Death Drive! Who knew? It looks like the Death Records title card was inserted to occupy the time that the street sign previously filled, so that George Aliceson Tipton's music cue would still fit here. 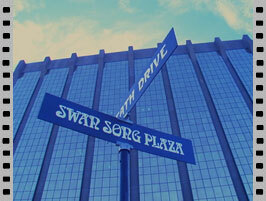 Click on the streetsign so you can find Swan Song Enterprises. 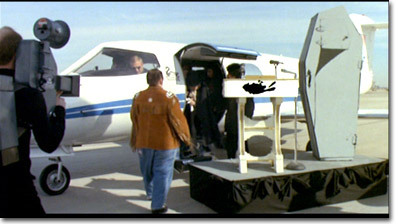 Another sequence that lost its earliest moments is Beef's unveiling at the airport. 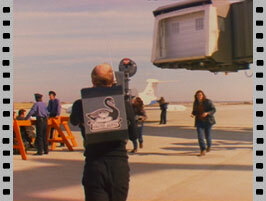 Here, in the first few frames of this clip (which, again, were not included in the film as released) we get a good look at the "Swan Song" camera pack on the back of the cameraman. You know the drill by now; click on the picture to see the footage. Click to see the frames you weren't meant to see! Click here for more Swan Song, and in your face, Peter Grant. 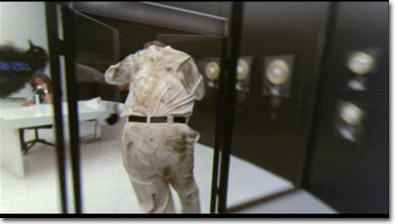 Click here to see Winslow enter the factory. 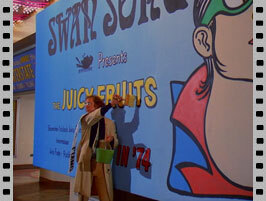 And, of course, the Swan Song logo was removed even in cases where it wasn't featured in the opening shot in a sequence. 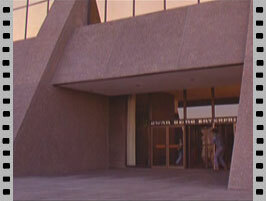 For example, as Winslow approaches Swan's office building for the first time, we can see if we squint that "Swan Song Enterprises" is the signage over the doorway. 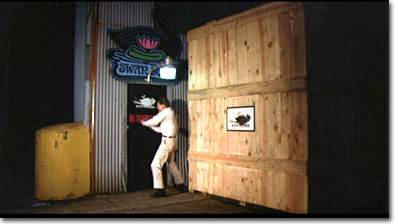 Later, when Winslow is being kicked out by Swan's goons, and the camera lingers, the name "Death Records" has been matted over "Swan Song Enterprises" above the front door. Click on Swan Song Enterprises to see the footage. 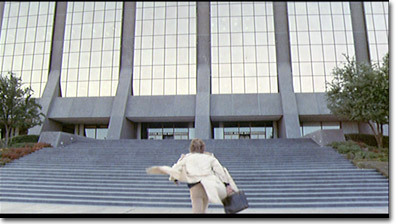 ...but as Winslow approaches, we cut away, in an abrupt, ugly and decidedly un-De Palma/Hirsch-like cut, to the receptionist for a moment, and then, by the time we get back to Winslow, he's all the way in the reception area. Click on Winslow and the bikers to see Winslow's perilous journey up the corridor. Here's an alternate take of Winslow's journey up the corridor, from beginning to end. Even after the cutting, there was still a little evidence of the Swan Song name outside the reception area. We see it later, after Winslow has escaped from prison, when he comes here again. And this second time, on his way in, he's running so fast that no cut is necessary; instead, there's a momentary mask-off of the Swan Song name as Winslow pushes his way through the doors. 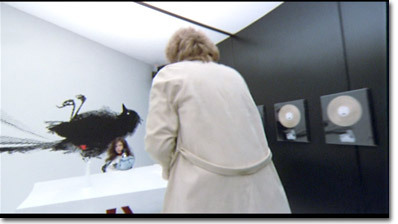 In this alternate take of Winslow's return to Death Records, we can see the Swan Song lettering above the door on his way in. There's a false start here, as the stagehands apparently have trouble getting the doors to open. 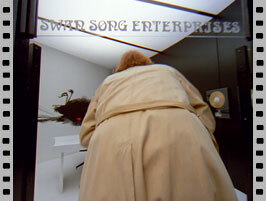 It turns out that the Swan Song Receptionist's card file had a big Swan Song logo on it; we barely get to see that in the film. As well, there were yet more names in the card file, including Abbie Hoffman, (Phantom associate producer) Michael Arciaga, Jack Nicholson, Martin Scorsese (misspelled "Scorcece"), Charley Pride, John Prine, Kris Kristofferson, Neil Diamond, Mick Jagger, Bob Dylan, Carly Simon, and "Melanie." 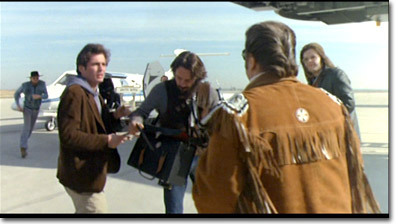 Perhaps the most noticeable Swan Song deletion is in the airport scene. As Philbin approaches the plane, we can dimly see "Swan Song" written on the podium in the distance. 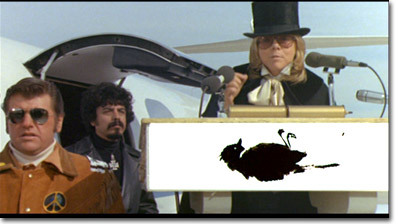 As we get closer, however, the podium has the dead songbird where the "Swan Song" lettering had been. Here's what it looked like before the alteration. Next, as we're about to pan over to Beef's coffin, the film suddenly gets grainy, as if it had been shot on 16mm stock. What's going on here, it appears, is that Hirsch instructed the processor to crop out the bottom half of the frame (which meant that what was left would be grainier) to avoid having "Swan Song" visible as the shot pans...it's much harder to obliterate the "Swan Song" wording as the camera is moving than when it's still. 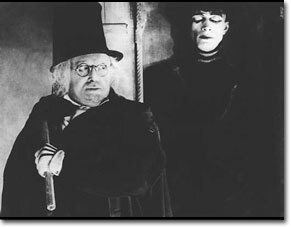 Oh, and hey, while we're at it, here's how it looked in 1919, in the scene from The Cabinet of Dr. Caligari that appears to have served as the inspiration for Beef's unveiling. 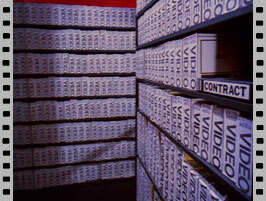 We suspect that the reason that this shot, of the tapes in Swan's tape archive, was removed was all the readily visible Swan Song labels on the tapes. Click here to see the tapes. 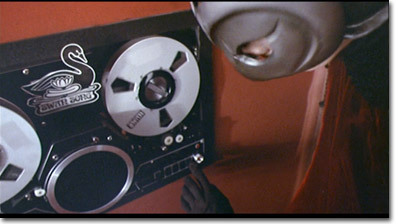 And, we think this shot of the Phantom perusing Swan's tape collection was deleted for the same reason. Click here to help the Phantom find the contract! Finally, many of the TV monitors have little dead songbirds superimposed over labels that had presumably said "Swan Song". 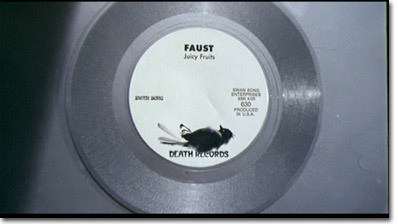 The campaign to eliminate references to swans even made its way to the movie poster and album cover. 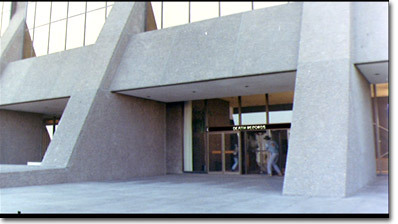 On the left is a photo of John Alvin's original painting for the Phantom movie posters, album cover, and other marketing collateral, as it appeared before Mr. Alvin modified it, painfully and by hand, at the direction of Fox advertising executives. 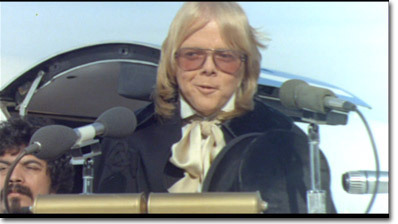 As can be seen, it differs from the final version that was actually used (on the right) in two significant respects: First, in this pre-modified version, the neon lights form symmetrical swans on either side of Paul Williams' head, while in the final version, the swans are gone, and have been replaced by stars. 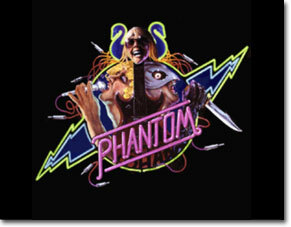 Second, the title on the original version is merely "Phantom," rather than "Phantom of the Paradise." 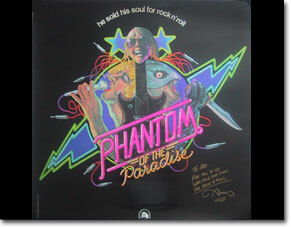 The modifications were imposed as a result of Fox's concerns about the Swan Song threats (with respect to the swans), and (with respect to the addition of "of the Paradise") possible conflicts with King Features, which owned a comic strip entitled "Phantom". We at the Archives think this is a shame; the swans were a very nice, witty touch of detail, and we like the shadowing of the word Phantom in the background, which is obliterated by the addition of "of the Paradise." 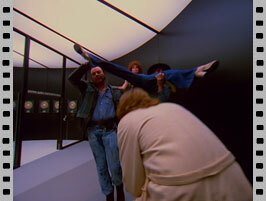 For more outtakes and cut scenes exclusive to The Swan Archives, check out our Outtakes Page.